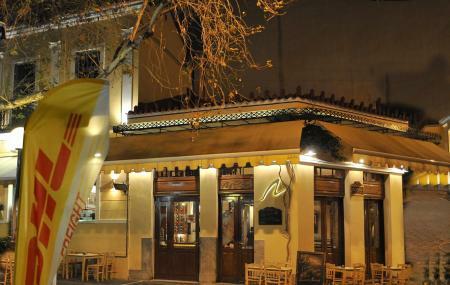 Find hotel near Lithos - Mesogeios Restau ..
Lithos Tavern Restaurant is one of the best Greek restaurants in Athina. There are two halls – Lithos and Mediterranean halls in this restaurant. Before 1982 there was a refectory, but for about 20 years this reserved place is serving quality food and hospitality to the visitors. Lithos Tavern Restaurant has a wide range of menu including vegetarian and nonvegetarian main courses, side dishes, soups, salads, ointments, mezedes, and many more. To taste delicious Greek food, book your plate at this restaurant through online or call. How popular is Lithos - Mesogeios Restaurant? People normally club together Passaggio and Athens Center Square Hotel while planning their visit to Lithos - Mesogeios Restaurant. So many Chris’s in the world, but the one at Lithos is a Chris everyone should visit during their time in Athens!! This was my favorite place that I ate at during my visit and I wish I would have found them sooner so I could have ate there more than once! Seemed like a lot of locals ate there. Had a short wait but everyone around them was empty so that spoke volumes! The food was great but Chris really topped off the experience with his hospitality! Amazing place. The atmosphere is traditional and cozy. The staff is professional and friendly, with a sense of humor. Been in Athens for a week. We have visited Lithos 3 times, and they haven't disappointed. They are simply amazing!!!! Good place to eat something. Food was very good, large portions and not very expensive. The staff was really great. delicious fish of the day. very professional service. service nice, polite and helpful. they even organized a dish outside the menu. it was our last day in Athens and we will remember this place for a long time. delicious food. We came in and had a great time!! We had gotten here pretty early, so it wasn’t super busy, which was perfect for us because it was nice and quiet! We had some amazing appetizers, main dishes, desserts!! We definitely recommend coming here!! !